We provide complete spectrum of Business Intelligence (BI) and data warehousing services to clients on a global platform. We help you choose the appropriate BI tools and build high-quality BI and data warehousing solutions to unlock key trends and make better business decisions. Companies are recognizing the need for accurate and timely information at all times – from business strategy and execution, to support. 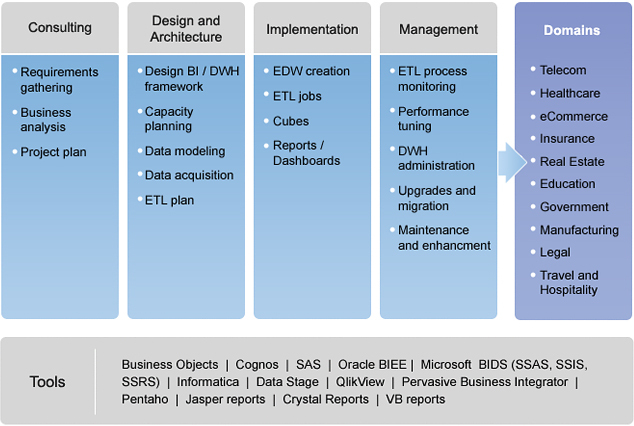 It has become mandatory for companies to take a robust approach towards design, implementation and management of BI solutions to successfully unlock the hidden value in their corporate data. However, to address all facets of their BI needs, companies require people with the right combination of technical skills and domain knowledge. With nearly a decade long practice in developing complex BI and data warehousing solutions, we offer the complete spectrum of services including consulting, design and architecture, implementation and management services. We have hands-on experience and certified professionals across leading BI products such as Cognos, Informatica, Microsoft technologies (SSAS, SSIS, SSRS), Data Stage, Pervasive Business Integrator, and more. Our experience spans leading ISV and enterprise clients in different industry verticals worldwide. We have successfully executed complex projects with large data warehouses (>30TB), multiple databases / data sets (from multiple locations) and real-time reporting. Our ability to deliver value year-on-year has helped us maintain long-term relationships (6+ years) with our clients.